We are pleased to provide you with a Media Measurement report with audience statistics on Top TV Stations and Top Radio Stations for Quarter 1 2017 in Kenya, where the GeoPoll Media Measurement service is currently available. Radio Citizen leads consistently in ratings throughout the day whereby its highest ratings records at an average of 6.64 between 6-8AM. 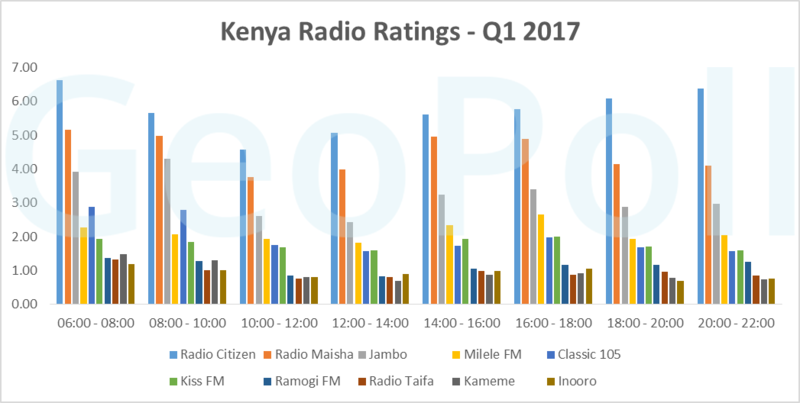 Radio Maisha takes the second ratings position with its highest point being between 6-8AM with an average of 5.16, while Jambo station achieves the third position in ratings nationally. The top spot is still maintained by Citizen with a share of 16.2%. The second highest share of listeners is Radio Maisha with 12.8% followed by Jambo which maintains its third position in share with an average of 9.2%. The high share of 34.0% for other stations not within the top 10 shows the large number of radio stations in Kenya, which broadcast across the country at a regional level. Using the daily data collected through GeoPoll's Media Measurement Service, GeoPoll has analyzed the top TV stations in Kenya for Q1 2017. We examined both ratings and share for the top stations in Kenya. The below chart shows the average ratings for the top 10 stations during the peak hours, from 19:00 to 21:30. Citizen has the leading spot in ratings during peak hours at the national level. Its highest rating is during primetime at 8.30PM with an average of 10.83. KTN takes the second lead in rating only between 7-7.30PM. At 9.30PM, there is a tie between NTV and KTN while the rest of the times 8-10PM NTV overtakes it. KTN News consistently takes the fourth position during the peak hours nationally. Citizen leads with the highest share of 33.7% of viewers followed by KTN at 11.1% then KTN News at 8.8% nationally. NTV follows closely with 8.5% in the share of viewers. The share for other stations outside the top 10 indicates that only 12.4% of radio stations in Kenya, which broadcast across the country at regional level.